Get all the health benefits (hello collagen!) from this bone broth gravy without hours of cooking time. We love bone broth – which is why we’ve also gathered up some of our favorite bone broth recipes into one spot! 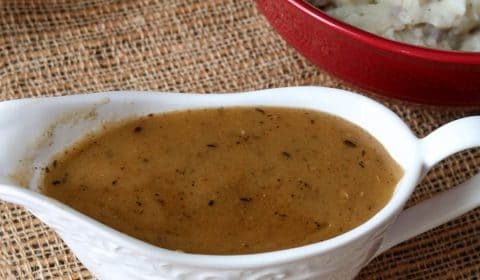 This homemade bone broth gravy can be made with or without roasting meat, just simply combine butter, gluten-free flour, and bone broth or drippings from your roasted meat. If you don’t need a gluten-free option, feel free to use regular all-purpose flour. Follow the quick and easy directions below to create a rich and creamy, yet good for you bone broth gravy. What is bone broth gravy? Have you ever noticed that the drippings from your cooked turkey, chicken, or beef could turn somewhat gelatinous after sitting? This is the collagen from the bones and is SUPER good for you! Bone broth gravy is simply gravy made with either the drippings from the roasted meat or using bottled bone broth. By using the drippings from your roasted meat, you’ll also gain the flavors of any spices you may have rubbed onto your meat. But, if you’re just cooking something like a turkey breast, using bottled bone broth will give you the collagen benefits of bone broth gravy. Speaking of collagen, ever heard of collagen injections for your skin? Well, by consuming bone broth you’re consuming natural collagen which not only helps your skin but also your joints, ligaments, gut, and immune system. Bone broth has been called ‘nature’s multivitamin’ due to its immense health benefits. Here’s an article that covers the health benefits of bone broth for your reading pleasure. 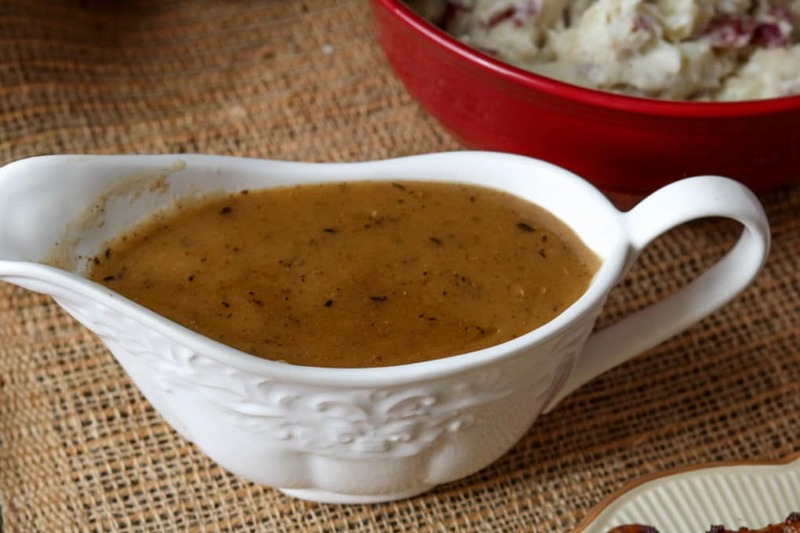 So, not only does this gravy taste divine, but it’s also good for your body! Use either the drippings from your roasted meat or packaged bone broth. You can also use a mix of both. I would suggest having packaged bone broth on hand in the event your roasted meat doesn’t produce much juice. For a gluten-free option, use any one-to-one gluten-free flour. For a dairy-free option, use ghee instead of grass-fed butter. Play with spices and season as you’d like. 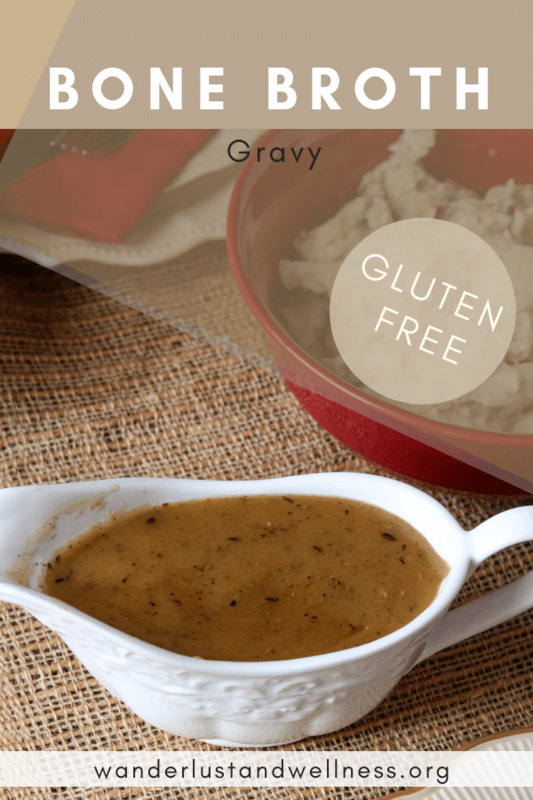 Try these other Thanksgiving recipes that go great with this bone broth gravy! A rich and savory gravy full of collagen and other bone broth health benefits. With just three simple ingredients and a gluten/dairy-free option, this bone broth gravy will be your new favorite. If you like this recipe please give it a 5-star rating! In a medium saucepan, melt the butter, then add in flour and whisk to combine. Pour in bone broth or turkey drippings liquid and bring to a simmer. Stir occasionally until it thickens. Reduce heat to low until ready to serve.